Over 1000 Game all level solutions and hints are available in this one page. scroll down to find out those answers. Over 1000. 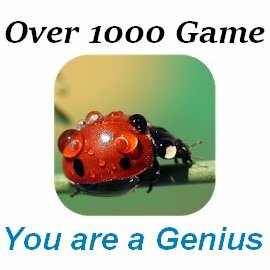 You are a genius game has a lot of levels with more difficulties and challenges but if you need any help with any level then you are on the right page. Guess the hidden word using a hint photo, the words are divided into fragments, puzzles are of varying complexity, from easy words, the solution of which takes seconds and too complex words, the solution of which will have to spend a lot of time. Over 1000 Level 1 Answers: geoglyph, crowd, Portrait, Femininity, Helmet, blond, splash, udder, newspaper, concrete, cartridge, hotel, graph, pectorals, biped, dinosaur, blowing, star, care, needle, emerald, rock, caries, quinoa, bell, space, cross, latte, linden, fossil, bench, henna, walrus, emigrate, cowboy. Over 1000 Level 2 Answers: beard, branches, sparrow, waist, switch, tie, octagon, kettlebell, hail, sponge, door, contract, city, nightstick, performing, knowledge, instructor, supplies, sausages, wings, louver, sky, pilot, podium, vast, corrida, light, rhubarb, twilight, farmer, trunk, egg, tunnel, abdomen, seamstress. Over 1000 Level 3 Answers: collar, choice, gargoyle, diving, helmet, jackfruit, dose, ruminant, flirt, amphibian, famous, viburnum, imitation, cilantro, jar, comedy, bonfire, cooking, lion, lumberjack, moose, attack, custom, paella, thigh, buddies, saber, spool, strawberries, ostrich, stilts, electricity, combustion, lock, tram. Over 1000 Level 4 Answers: harvest, tentacles, nightingale, memories, hatching, gondola, pear, twelve, gerbera, rain, shower, detective, paddock, drought, giraffe, caviar, rope, censorship, leather, centaur, orca, confectioner, bush, farmers, locomotive, mayonnaise, pedicure, rafting, divorce, Spain, hip, jaw, insect, Buddha, interview. Over 1000 Level 5 Answers: valley, balance, volcano, mountains, December, diet, queen, hat, speedometer, food, snack, women, disability, captain, ketchup, climate, horse, bloat, creative, longship, London, magic, embankment, night, paprika, alabai, saxophone, vault, polisher, structure, exercise, roof, elf, icebreaker, reproduction. Over 1000 Level 6 Answers: blogger, Maasai, bazaar, pedigree, harm, explosion, mower, hungry, garnish, mushroom, kindness, hedgehog, crane, oak, reserve, heel, clover, thorn, acquaintance, thatching, curious, shades, glider, cutlery, Sakura, sensor, dance, festival, heron, grooming, spinach, sheep, dome, trash, ginger. Over 1000 Level 7 Answers: sturdy, wok, top, knitting, version, depth, pressure, vinyl, rodent, butler, trees, position, diabetes, delivery, fun, snake, temptation, camping, red, book, mustard, heat, medicine, socks, bandit, gloves, barrier, recipe, figurines, surprise, surgery, seams, birthday, literature, hematogen. Over 1000 Level 8 Answers: fuse, moray, booster, galaxy, goal, cooking, vulture, dentist, esophagus, domino, friend, greedy, winter, riot, painting, whale, wheel, spear, wildcat, crank, ridges, laser, hole, lemur, Mexico, knife, signature, stadium, stool, tropics, fleet, cyclone, neck, interest, demonstration. Over 1000 Level 9 Answers: Sydney, cheek, Babylon, ammunition, flare, performance, hammock, rook, children, long, dune, pigeon, breakfast, inertia, canal, cone, sign, puppeteer, paw, Mexican, downpour, tombstone, solitude, music, recycling, empty, happy, calf, coal, watch, fence, petals, samurai, chin, teeth. Over 1000 Level 10 Answers: grandchildren, pulsations, speculation, imager, calceolaria, mole, storage, adrenaline, thinker, viper, goslings, jeans, gesture, cufflinks, player, interior, proposal, squares, crocus, mother, online, alleyway, healthy, artery, sprinkler, chamomile, seasons, ladder, cornice, football, chimney, expert, barley, giant, Tachometer, raven. Over 1000 Level 11 Answers: stepdaughter, lambrequin, bait, shin, carving, cassock, general, tower, geisha, barbeque, perfume, building, peel, bed, screen, triceps, mango, mosque, expectation, illumination, sail, handkerchief, joy, drawing, rows, surfers, spaghetti, stewardess, injury, manor, uniform, skewers, steeple, assistant, chanterelles. Over 1000 Level 12 Answers: qualification, spleen, worried, watermelon, race, disinfectant, raccoon, measurement, hood, stepmother, matador, panda, new, pepper, beer, lavender, surface, landing, wheat, advertising, rodeo, Aurora, snow, Gardner, remedies, rigging, papyrus, trumpeter, facade, buffet, beehive, cistern, bristle, tiramisu, entourage. Over 1000 Level 13 Answers: shy, diaphragm, goddess, palindrome, reaper, colleague, namod, Krishna, lung, runabout, swelling, patronage, collar bone, grandfather, temple, lighter, padded, touchy, prosecutor, vortex, router, secret, division, symbolism, tendon, tango, volute, amplifier, skull, elasticity, departure, hybrid, bib, liver, intention. Over 1000 Level 14 Answers: pollination, coronation, magnolia, kidney, manager, beef, stomach, rider, lawyer, tasting, encashment, composition, bridge, tolerance, scissors, black, papaya, flame, passage, schedule, symbol, plug, listeners, guard, therapy, reed, grooming, flasks, lens, skiing, chinchilla, electric, tag, cartilage, corkscrew. When will the answers to level 15 be published?